Is this normal/okay? If not, how can I combine them? No. You still have one E: volume. It's just in two pieces on the disc. Psycogeek is wrong. The text description does match the graphics. Xe has not paid enough attention to what is clearly written there. Even though Disk Manager has told you in that screenshot no fewer than five times that this is a dynamic, not a basic, disc, you've both still overlooked this. Moreover, Disk Manager is clearly saying that the text list is a list of volumes, not of the underlying disc slices. You have one E: volume, and it is listed once. You extended a simple volume into another slice of the disc, so now Disk Manager is diagrammatically showing you the two slices of the disc that, when concatenated, make up the whole of the single volume. Some simple arithmetic confirms that, indeed, 128 is 30 plus 98. And because of the way that you've done this, the slices are in reverse order. The first (30GiB) piece on the disc is actually the second part of the actual volume. 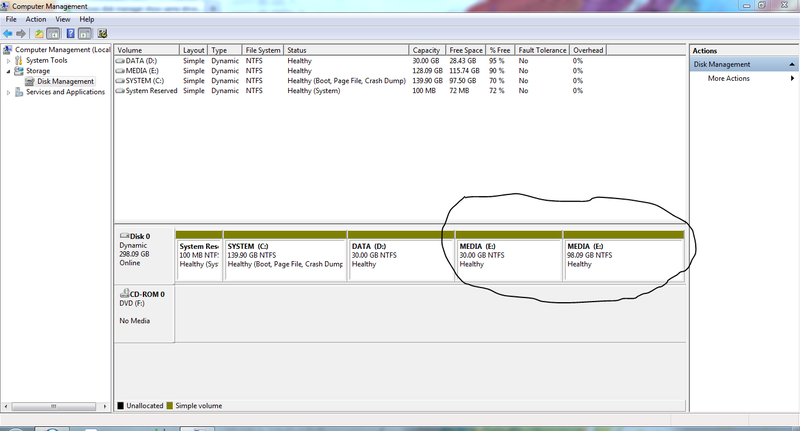 How do I merge two unallocated, non-sequential partitions on the same logical disk? Is there a way to move Windows partition on the same drive?